The apostles created seven deacons, one of whom was Stephen, but his good works got him into trouble and he was tried and found guilty by the council, the Sanhedrin. ‘But he, being full of the Holy Ghost, looked up stedfastly into heaven, and saw the glory of God, and Jesus standing on the right hand of God.’ When he told the Sanhedrin what he saw, they stopped their ears, ran upon him, cast him out of the city and stoned him. One of the stoners was called Saul, later to be known as Paul. Stephen’s feast day is today, Boxing Day, although, it being Sunday, this year Boxing Day is officially tomorrow. Boxing Day is associated with the giving of alms to the poor and needy and goes back a long way, ye, even unto the Romans, who I don’t usually associate with charitable acts. Stephen, the first martyr, is generally forgotten now but I got to know his story a year or so ago whilst studying Filippo Lippi’s great fresco cycle at Prato. There on the walls of the main chapel is the life and death of the saint told in pictures, drawn as much from The Golden Legend of Jacobus de Voragine as from Acts chapters 6 – 8. (If you need to get into the medieval mind, especially that of a woman, you should read The Golden Legend and suppress all modern cynicism as you do so). This week I’m putting the finishing touches to my latest novel, A Gift for the Magus. It feels wonderfully fitting – and unplanned – that this particular book should be completed between the Feast of Stephen and Epiphany. 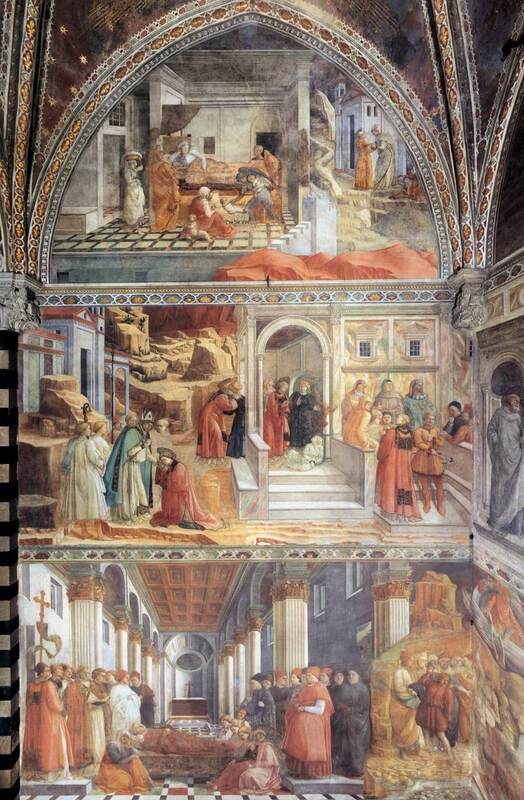 In my mind, Lippi is symbolically linked to Stephen, and Epiphany, when the three wise men came, is linked to Cosimo de’ Medici, the Magus of the title. The snow remains deep and crisp and even outside, so it’s a great time to be concentrating on writing. And if I ever wanted a good omen, I had one yesterday when the BBC did a programme on the painting which is central to the novel: Lippi’s Adoration. So today and until January 6th I think I’ll forget about the persecutors, the stoners, the vile and vicious Sanhedrin, and remember instead Stephen’s theophany: what he saw. Perhaps it’s a bit crass to liken writing to martyrdom, but it follows the same pattern. As a writer you must stay true to your vision, no matter what everyone else says, and keep your eyes fixed on heaven as the stones fly. Sarah Johnson once said that what she appreciated about my work was the large part religion plays in it. But how can it be otherwise? To be authentic, you not only need to imagine the religious life of the times, but to make sure it’s the appropriate form of it. For instance – and apologies for stating the obvious – until the 16th century, all western Christians were Roman Catholic. And a Roman Catholic isn’t just a Protestant in a hat. If we’re not born RC, but our characters are, we have to do some work of the imagination. This is Christmas week and we are celebrating a great Victorian festival and the annual cull of ugly trees initiated by Prince Albert. Was there Christmas before Santa? Oh yes, of course, but to get a flavour of it, listen to medieval carols (great programme about them by Howard Goodall last night). It was a feast, one of the great festivals of Mary and usually called not Christmas but ‘the Nativity’. Yes, it coincides with Solstice and represents the rebirth of Light, but our medieval forefathers may not have seen it that way, not if they lived in cities; such pagan things were folk memories from the ancient past, kept alive in the country by customs the origins of which, over time, were forgotten. To get a flavour of medieval Christmas, deck your halls, slaughter your pig, mull some cider, wassail the orchard and reflect on the Madonna, close to her term but with nowhere to rest in Bethlehem. A new drama began this evening on BBC at 7pm called ‘The Nativity’. I felt disinclined to watch it, presuming it would be a ‘modern take’ with Mary the single mum-to-be desperate to marry, you know the story, but then I heard the scriptwriter interviewed on the radio, talking about the depth of his research and the effect writing the story had on him (planting the seeds of faith into an agnostic heart) and so I watched it and wasn’t disappointed. In fact, I was enchanted. Yes, I could pick a few holes in it, but it was such a treat having a nativity play for adults, with wise men and shepherds, that I’ve decided not to mention the few errors spotted, like the Angel Gabriel not having wings. I mean, duh…. Apart from that, and some Englishmen playing Moslems playing Babylonians, the research seemed first rate. I shall certainly be watching for the rest of the week. It can be difficult to remember with all the fuss of Christmas, but this is the darkest time of the year. The very function of all midwinter festivals is to make us forget that. Despite the modern fervour for celebrating the summer solstice, all the great ancient monuments, such as Stonehenge and Newgrange, were set up to mark the midwinter solstice. For now is the scary time. In our light-filled world where you can get every variety of food all year round we have become quite divorced from this crucial point in the agricultural year. What midwinter heralded was famine. Since there would not be enough feed for the cattle, they were slaughtered. December was a great time for fresh meat. Happily it coincided with the fermenting of the grape harvest. Midwinter has been a feast since at least the beginning of farming, and one suspects before that, too. Saturnalia in ancient Rome ran from 17th to 23rd December, and the Feast of Brumalia – Bacchus – ended on 25th December. In ancient Greece it was Lenaea, the Festival of the Wild Women, commemorating – and re-enacting – the dismemberment of Dionysius by the Maenads. That festival included wine miracles, when jars containing water were left sealed overnight and opened the next day to find the contents had turned into wine. The festival ended with the rebirth of Dionysius as a sacred baby. The Celtic midwinter festival also centred on a sacred birth, that of Pryderi to Rhiannon. In the later times of the Roman Empire, when it had become a melting pot for so many races and religious cults, the Festival of Sol Invictus, the Unconquered Sun, was established. It was a joint celebration of the Syrian god, Elah-Gabal, Sol, Mithras and, later, Jesus. In our own multi-cultural times, we celebrate Hanukkah and Divali around the same time as Christmas. And you don’t have to be Christian to send cards, get presents and have decorated trees. This is a time for everyone to huddle together, light the lights and forget the weather. The time of the eclipse has been given as 0633 to 1001 GMT, with total eclipse from 0741 to 0853 GMT. It will be best observed from USA and Canada. In Europe we may see the beginning of the eclipse just as the moon sets on Tuesday morning. So up you get at dawn on Tuesday to crunch about in the snow, because yes, we have a white Christmas to add to the pile of omens, and see the moon perhaps go pink or coppery. Let’s offer up a prayer of gratitude that, thanks to supermarkets, we are not facing deep winter and the famine months in the raw. But they did back then, so for authenticity in your work, gen up on food preservation and the taste of salt beef and fruit leathers. I’m an immaculate granny of six, not having any children of my own (David has five). I knit while watching TV – it’s what grannies do, after all, even immaculate ones. In my spare time I practise sacred geometry and study the Bhagavad Gita in the original Sanskrit, strange but true. The one thing sure to remind me about the celestial spheres is bird song. I believe everything is One and that life is sacred. I believe writing can be taught but you’ve got to want to learn. I love everything about vegetables except eating them. Limbourg Brothers: A wild boar hunt in the forest of Vincennes. Well, I apologise for neglecting this blog. The term has been a difficult one, with the strictures on tutors now so impossible to live with that I’m considering quitting. Is it my fault if students don’t get A’s? Apparently so. Is it true that A = pass and every other grade, including B+ = fail? Apparently so, and if I don’t want end-of-term deputations and the increasing danger of litigation, then I must award A’s to all. This is no world to have any sense of integrity. A sympathetic email from Lindsay Clarke yesterday said it was for this very reason that he quit teaching undergraduates. Lindsay’s latest novel, The Water Theatre, is a brilliant evocation of the schizophrenic nature of people in the second half of the twentieth century, where politics and spirituality were opposed. It is a book of love and healing and I recommend it wholeheartedly. The paperback is going into a second edition within six months of publication. Apparently it is difficult to put a date to Yule Tide. You kind of know when it is, and I kind of think it is now. The local shop has Christmas trees on the forecourt, the interior has more decorations than goods on sale, and the swans on the pond are trying to maintain their dignity as they walk across ice. People come back from town with rolls of wrapping paper sticking out of over-full carrier bags, and lots of Christmas cards come through the post. Yep. Definitely Yule Tide. We sit under Slankets in front of an electric heater and dream of chestnuts and a real fire. Salad won’t do for lunch, it has to be hot soup or beans on toast. When there’s a gap in the freeze, we dash to the allotment to excavate leeks and snap off sprouts, and then we dash back again as the sun sinks in it’s ridiculous “I’m off early, it’s winter” routine, leaving the sky pink above Wytham Hill and its brown smudge of trees. Without doubt, this is Yule. We don’t hunt anything any more, not even thimbles, but in the past December was the great hunting season. The boar’s head didn’t just get there on the table, you know; the boar was caught in the forest by hunters with boar hounds and torn to pieces first. The picture from Tres Riches Heures du Duc de Berry shows such a hunt in the forest of Vincennes. For those who have read The Rebirth of Venus, the castle in the background is where Pico della Mirandola was imprisoned. We have a community farm in the village, and when I heard some lambs were going to slaughter, I ordered a leg for Christmas dinner. The shepherd (aka editor of local paper) cycled past the house this morning and I dashed out to remind him of our order. ‘Oh,’ he said, ‘we only did two hoggets this year.’ So I dashed back in to my dictionary: hogget – one-year-old sheep. ‘Lamb’ is a fairly loose term these days. We never have mutton now, and I’ve never heard of roast hogget. Both Pagan and Christian traditions agree that Yule is a time for feasting, and we mustn’t leave out the trees. Wassail is drinking the health of orchard trees, and hanging toast soaked in cider from apple boughs to bring a good crop. There may be sense behind the romance: small birds attracted by the toast may stay for a bug dessert, cleaning the tree of pests for the coming season. So I’m going to go and mull some cider and decorate my apple tree, singing, Here’s to the old apple tree. That blooms well, bears well. Hats full, caps full. Three bushel bags full. An’ all under one tree. Hurrah! Hurrah! Oh, and lest I forget, I’ve been awarded ‘The Versatile Blogger Award’ by Helen Hollick.